Constructed to welcome the world to the 1915 Panama-California Exposition, the Santa Fe Depot is a city landmark known for its soaring towers and tiled domes. 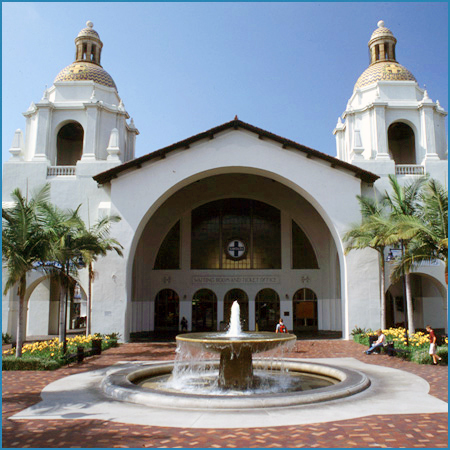 Union Station, also known as the “Santa Fe Depot,” has served residents and visitors to San Diego for almost 100 years. Located in the heart of downtown near the cruise ship piers and other bayside attractions, the station anchors the larger Santa Fe Place, named after the Atchison, Topeka, and Santa Fe Railroad (ATSF) that conceived and built the station from 1914–1915. The 15 acres around the building are being developed as a new mixed-use quarter that will enliven the city center and fill in empty parcels with shops, residential units, and office space. Due to its role as a major transportation hub for southern California, San Diego often ranks among the top ten busiest stations in the national Amtrak network; the Pacific Surfliner is one of the most popular Amtrak routes. Many travelers remember the rows of palms that line the platforms at the Santa Fe Depot and stretch to the horizon. The building of the Panama Canal greatly excited San Diegans; after the disappointment of losing their status as the West Coast terminal of the ATSF, they believed that their second chance had arrived. The first major harbor on the West Coast of the United States, the city seemed destined to finally grow into a major port as a result of shipping from the Canal route. To promote this idea, civic boosters pushed the city to hold the Panama-California Exposition to celebrate San Diego’s natural, cultural, and business strengths. From early 1915 to the end of 1916, tens of thousands of visitors flocked to the fairgrounds in Balboa Park, which was designed as an idealized Spanish city of patios, arcades, and shining white buildings. Organizers hired well regarded New York architect Bertram Goodhue to plan the complex, and they collectively decided on a Spanish Revival style that paid homage to the sculptural qualities of the Spanish Baroque. This romantic architecture and design language was considered an appropriate bridge to California’s Spanish colonial past. In order to accommodate the increased crowds expected for the fair—which the ATSF encouraged through special fare packages—the railroad committed to building a new and larger train station to replace the first depot. The California Southern Railroad (CS), an ATSF subsidiary, had erected the first depot two years after San Diego received its transcontinental rail connection in 1885. Elaborate exterior woodwork made the basic rectangular structure appear rather grand, for it boasted numerous gables with fancy millwork designs and a prominent central clock tower with a pyramidal roof. According to period accounts, the station was painted dark red with dark green trim. A deep canopy wrapped around the building to protect waiting passengers from the sun. The new Santa Fe Depot was designed by the San Francisco firm of Bakewell and Brown. The partners had both worked for Bernard Maybeck in the San Francisco Bay area where he was known for his singular Arts and Crafts aesthetic. Arthur Brown, Jr. was also a graduate of the École des Beaux-Arts where he learned the principles of neoclassical architecture and space planning. While they were working on the San Diego station, the duo was also finishing the design for the San Francisco Civic Center, considered one of the country’s finest Beaux-Arts complexes. The $300,000, steel-framed Santa Fe Depot was designed in a simplified Spanish Baroque language that avoided much of the sculptural work often associated with that design movement, but did include the typical Spanish tiled roofs, decorative tile work, arcades, and whitewashed walls. The architects laid out the depot along the tracks, with the zones of the station becoming successively private as one walked from south to north. Just outside the principle entrance to the station complex, trolleys dropped off passengers before turning around and heading back downtown. Travelers passed through one of the three large arches of a projecting pavilion to enter an open-air patio enclosed by shady arcades. Paved with bricks, the edges were lined with benches as well as potted palms and flowers. Along the outside edge of the entrance patio was a row of large palms which had been moved across the tracks from the grounds of the old station. The north side of the patio was fronted by the façade of the depot which is dominated by two identical towers with colorful domes covered in tiles in shades of blue, green, yellow, and white in a zigzag pattern. The towers recall those of regional missions while the domes are similar in design to those used on the exposition buildings. The central gabled portion of the depot between the towers features an enormous arch which in turn frames five smaller arched doorways leading to the main waiting room. Above, a large Diocletian or “thermal” window allows ample light to flood the interior; this window arrangement is mirrored on the opposite end of the hall. Inside the main waiting room, measuring 170 feet long by 55 feet wide, the gabled ceiling of natural redwood beams is supported by a series of large two-story arches from which hang bronze chandeliers. Along the sides of the room were kiosks that sold convenience items; the west side was punctured by doors set into arches that gave out onto the platform, which was also arcaded in order to shelter waiting passengers from the strong California sun. The most recognizable feature of the waiting room is the eight-and-a-half foot tall wainscot executed in glazed faience tile manufactured by the California China Products Company of National City. Elaborate Hispano-Moorish designs are executed in green, yellow, blue, white, and black and the bottom and top edges are finished with a frieze of stylized ziggurats. A large tile map of the Santa Fe system once graced the upper wall. The original oak benches still run the length of the room. Between 1916 and 1951, the Santa Fe Depot was a true “Union Station” because it also harbored passengers of the San Diego and Arizona Railway which served points east. Beyond the waiting room was a Fred Harvey Dining Hall in which the tile work continued; the Harvey Company ran all of the concessions for the ATSF. Upstairs on the east side, a second floor contained railroad offices. The Santa Fe, proud of its structure and ever the self-promoter, plastered its trademark cross-within-a-circle all over the building. It is found in the tile work of the domes and the waiting room pilasters, as well as on the chandeliers and windows; in the 1950s a large “Santa Fe” sign was placed on the roof. Continuing beyond the waiting room, there was a one-story freight building and other work space off-limits to visitors. On the exterior, the freight building and the depot are visually united by the trackside arcade. As railroading declined in the mid-20th century due to the increase of airline travel and the development of the interstate highway system, the entrance patio was demolished for a parking lot and by 1971 there was talk by the ATSF of tearing down the depot. Community opposition stopped this move, and the structure was listed on the National Register of Historic Places in 1972. Ten years later the building was refurbished and has subsequently undergone additional restoration work. In the late 1990s, the parking lot that replaced the former patio was removed and an ADA compliant landscaped plaza was installed that includes a fountain, palms, planting beds, and seating. The Baggage and Express Building was restored to its 1914 appearance and seismically retrofitted so that it could house a branch of the Museum of Contemporary Art. A modern three storey addition covered primarily in corrugated metal was constructed at the back of the building in 2007 to accommodate other art installations. To secure the coast from Russian explorers and fur traders, King Carlos III of Spain authorized the creation of a chain of forts and missions to protect strategic sites that could be of future use to the Spanish Empire in North America. In 1769, the fort or “presidio” at San Diego was founded on the hills to the northeast of the harbor entrance; soon thereafter the Mission of San Diego de Alcalá was established by Franciscan friars to work toward the conversion of the American Indians to Christianity, a stated goal of Spanish colonization. The Kumeyaay people had long inhabited the coastal border region between Mexico and California, and many of the tribes migrated between summer and winter villages. The goal of the missionaries at San Diego was to bring the Kumeyaay to the mission complex and its agricultural lands where they would work at trades and farm under the guidance of the priests while also receiving religious instruction. The Spanish referred to those who did settle at the mission as “Diegueño” (“of San Diego”). Within the first five years, the Franciscans moved the mission six miles to the east to quell Kumeyaay who were wary of the military presence at the nearby presidio; the new site also provided better water resources along the San Diego River and was closer to Kumeyaay villages. After Mexico gained independence from Spain, the missions were secularized and many fell into private hands and subsequently into disrepair. Restoration of Mission San Diego de Alcalá began in the 1880s. Today it is an active parish church and is a popular stop with California elementary school children who visit the site as part of their year-long study of state history. San Diego remained a modest agricultural community until the mid-19th century, when newcomers from the east began to dream big about the future. Many of them headed west in the Gold Rush of 1849; once the fever subsided, some decided to settle permanently in the town that had grown up around the ruins of the old presidio. Their development schemes often focused on San Diego Bay, which is one of the finest natural harbors on the West Coast. The best known promoter of the area was probably Alonzo Horton, who built a business in San Francisco once his hopes of gold riches subsided. In the late 1860s he purchased 800 acres along the bay in what is now downtown San Diego; he proceeded to build a wharf, a hotel, and other enterprises. Horton endlessly promoted the town as a resort destination and the potential site of a key port. A major fire in the Old Town in 1872 convinced many residents to move to “Horton’s Addition” closer to the bay. By the 1870s, San Francisco and Los Angeles were the state’s principle railroad and maritime hubs. The foremost railroad in California was the Southern Pacific (SP), which ignored San Diego’s request for a rail line. Therefore, civic boosters led by landowner and businessman Frank Kimball reached out to other railroads, eventually making a deal with the ATSF which was then building its line through New Mexico and Arizona and was trying to figure out how to reach the Pacific Ocean. After much debate, the ATSF decided to enter California through the Mojave Desert and the Cajon Pass east of San Bernardino. To access San Diego, the railroad started building a line under the subsidiary California Southern Railroad (CS) that was intended to reach Barstow, CA to link with the SP line to the border with Arizona. Kimball and others donated land and money with the promise that the ATSF would build its terminus on the central shore of San Diego Bay at National City. From 1880-1882, the CS line drove northward through coastal swamps and bogs and inland gullies and canyons, requiring numerous trestles and other infrastructure built by Chinese laborers. It finally reached Colton outside of San Bernardino in March 1882 where it met the SP tracks. After a lawsuit with the SP and years of delay, the CS was finally able to cross the SP tracks at Colton and continue on to Barstow which it reached in 1885. From there it paid to use SP tracks to the California-Arizona border town of Needles. Not until 1897 did the ATSF gain full control of the tracks between Needles and Barstow, truly giving the railroad a secure passage through California to the Pacific. In 1885 the first transcontinental train reached San Diego, but in an ominous sign, the next year the ATSF built a line from San Bernardino to Los Angeles. Months later the railroad moved the facilities at National City to San Bernardino, ending San Diego’s hopes for becoming a bustling railroad terminal and port. Although Kimball and others felt betrayed by the ATSF, the railroad did lead to growth: between 1880 and 1890, the town’s population increased six-fold. A rate war in the last half of the 1880s between the SP and the ATSF dropped fares from the Mississippi River to the Pacific coast from $125 to $25 or less, thereby encouraging settlers to head west. The original route of the CS proved treacherous, as the inland portion through Temecula Canyon washed out in 1882 within a year of its opening. Although rebuilt, the line was soon replaced by the ATSF’s Surf Line which was laid through Orange County to meet the CS at Oceanside in 1888. It allowed a safer coastal link between San Diego and Los Angeles that avoided Temecula Canyon which washed out again in 1891 and was abandoned. The Surf Line was a popular ATSF route, especially during the summer when tourists flocked to resorts such as the Hotel del Coronado on San Diego’s North Island. Completed in 1888, it had an astounding 399 rooms with electric lighting that was inspected by Thomas Edison. The hotel remains in style today, instantly recognizable by its signature steep-roofed, tent-like pavilion that sits close to the beach. An art museum is just one of numerous attractions that encourage travelers to spend a few days in this growing metropolis which has blossomed as a center of the biotechnology and software industries. The presence of large U.S. Naval, Marine Corps, and Coast Guard facilities supports research and technological innovation in the defense sector. San Diego Bay hosts one of the largest naval fleets in the world which includes super carriers, submarines, a hospital ship, and other vessels. Visitors still flock to Balboa Park a century after the Panama-California Exposition to visit the fifteen museums, gardens, and performing arts organizations that dot its 1000 acres. Rail buffs head to the park for the San Diego Model Railroad Museum. It contains a scaled replica of the Santa Fe Depot down to the smallest details; kids make a beeline for the interactive Lionel layout. One of the most popular area destinations is the San Diego Zoo, which grew out of the collection of exotic animals abandoned in the city after the 1915-1916 fair. The institution’s 107 acres currently hold more than 4,000 animals representing 800 species. The Zoo is well known for its “cage less” exhibits that use topography and landscaping to contain the animals in settings that resemble their natural habitats; the Institute for Conservation Research works extensively in species-preservation efforts. Amtrak provides ticketing and baggage services at the San Diego station. ThePacific Surfliner service is primarily financed through funds made available by the State of California, Department of Transportation, and is managed by the LOSSAN Joint Powers Authority.